Jetski in Turks and Caicos, It Can't Be Beat! With Tropical Waves you'll have fun in the sun on your own personal jetski while safety is number 1 with us. Whether you want a guided tour or you want to explore all by yourself, Tropical Waves accommodates! 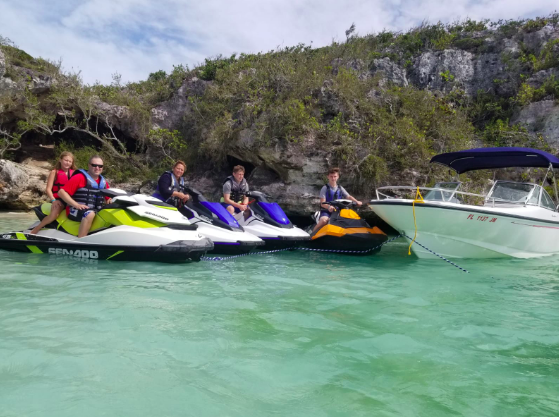 Go cruising along the beautiful, rocky shores of Sapodilla and Taylor Bay in the Turks and Caicos, or feel the adrenaline as you cut through the crystal clear waters of the sea in your own jetski. Explore the shores, cays and deserted beaches on turquoise water like you've never seen before. You can take it slow and explore or push your jetski to crazy speeds. Catch some killer waves as they spray water on your face to cool you down! Either way, this is sure to be a truly remarkable adventure. Turks and Caicos is the ideal location for any jetski activity, so don’t miss out! Meet us on Sapodilla Bay, Taylor Bay or Leeward and we'll have your jetskis gassed up and ready for you to ride the tropical waves! We can also drop jetskis off at your beachfront villa, just let us know! A guided tour is an excellent way to spend your day exploring the amazing shallow water and pristine coral heads. With your guide you'll discover the beauty of other islands: Parrot Cay, Pine Cay and Dellis Cay and take in the exotic marine life.